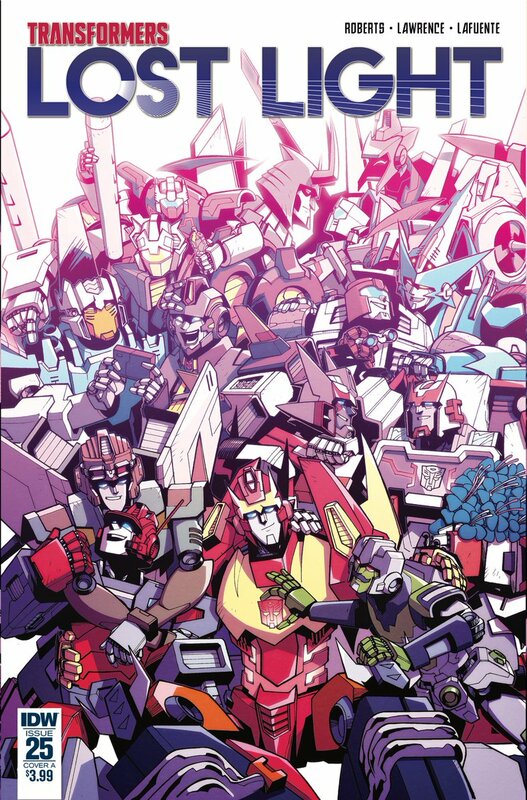 We a re sure many fans are looking forward for Lost Light #25, the final issue of the great adventure of Rodimus and his crew. Well, something is better than nothing, but we see the Autobots attending what seems to be a….funeral? Who the fallen warrior could be? Check the mirrored image after the jump, including one of the best recaps EVER (thanks to @MrAdyCarter for sharing it) and sound off your impressions on the 2005 Boards! It will probably be that guy who received a Rodimus star and praised for all his amazing achievements… despite never actually being shown in the comic. I forget his name and which issue that was from. Made me wonder if this is Brainstorm travelling from the past to witness the future, testing out the time case. It wouldn't surprise me if it's that. We've already seen a time portal stuck in the Lost Light, maybe he found a way to gather that energy and then flash himself forward……….. I just thought of something…. I think it's a rug pull reveal, like the funeral after Overlord's massacre. It's got to be DipStick. also, is anybody else concerned that Brainstorm has a BRIEFCASE!? That'd be a way to end the series! Thats not how that ceremony works. The viles of Innermost Energon are given by the living as a sign of respect, not taken from the deceased. This is honestly what has me thinking it's Rung. Misremembered or ignored by basically everyone, he winds up giving his life (which is probably a call he would have made anyway but the fact he had a terminal illness was probably the clincher that he'd do something like this eventually) to restore Cybertron and then there's some kind of memorial fund of innermost Energon set up in his memory. Granted, I feel like if it were Rung the funeral might have made more mention of him giving his life to restore those hotspots, so I could be wrong. 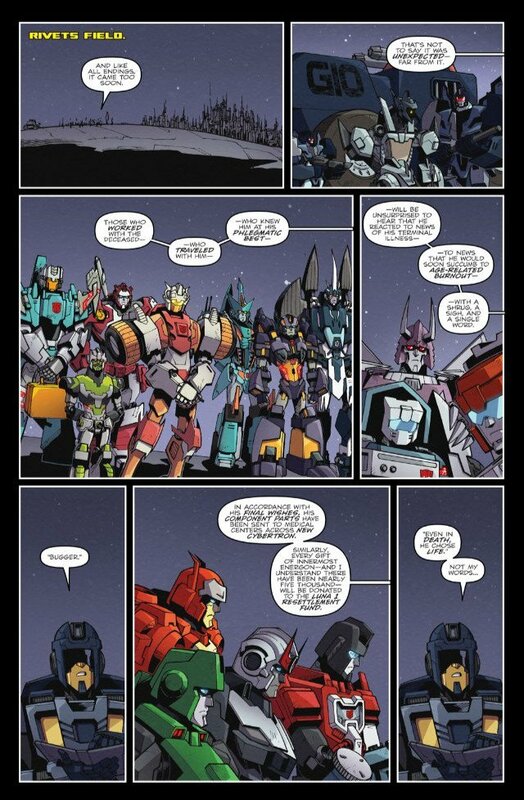 I think Thunderclash is the most likely other theory, backed up slightly by Rodimus not being there – I love Roddy but he's still petty enough to not go to Thunderclash's funeral even if everyone else wanted to. My dude, Nightbeat died like 6 or 7 entire issues ago – in very prominent and somewhat gruesome fashion – and thus makes zero sense as the bot they’re mourning for dying of old age/terminal illness. Sorry to hear about your other life stuff too. Ah justiceg my old nemesis. I have read every issue. I just forgot about night beat. I'd laugh till next Christmas if it was night beat. I have. I'm just not taking everything in. For whatever reason. I used to study every panel of mtmte. I have. I'm just not taking everything in. For whatever reason. I used to study every panel of mtmte. I used to have theories about every character and what could be ahead. Not anymore. Not for a long time. Lost light lost its charm a long time ago for me. It got boring. It didn't feel like a tf comic at times. Plus I've had a poor last six months myself. A double fracture of my arm saw me in hospital and out of work for 7 weeks. Also I moved jobs within my department which I didn't want. Various things. I just wasn't concentrating on lost light the way I had been. I'm one of the guys who wont be crying into his energon when it ends. I'm ready to move on. I'm hoping tf comics get back to basics. I know that's not a popular opinion but its mine. 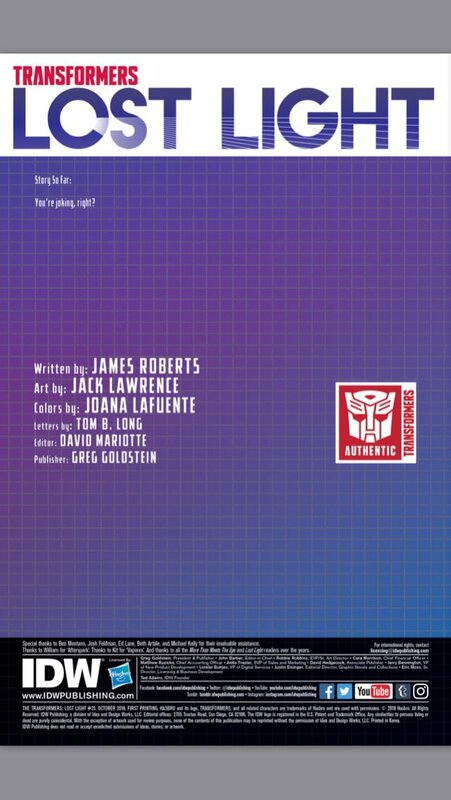 I hope it ends the way everyone hopes it does but with the exception of one or two issues I haven't enjoyed lost light the way I did with mtmte. Never mind that when the series began he was talking about he was getting old and wanting to find a successor. The diagnosis may go back to before then.